Having a mobile app for the first time is both exciting and important. According to the statistics, it can be estimated that anyone who has a mobile app can find users certainly. 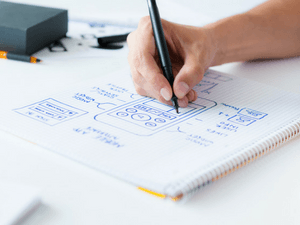 Things to consider when designing an app and also when increasing mobile user number is considered, it can be thought that creating a mobile app and publishing it is only a matter of decision. However, not all the apps can get the expected attention from the users. Firstly, it is necessary to have an app idea that offers worth to the users and make their lives easy. Then, trying methods that may attract users is beneficial. Here are the points that you should consider before creating your mobile app. A plan that is managed and handled according to the goals may help you to be more directive and productive. Developing strategies and performing these strategies through the determined goal is not only important for being permanent in mobile app world but also necessary in every division in life. So, before creating an app, when everything is just an idea, how can you find your goal? To find an answer to this question, thinking yourself as a user that using your mobile app may help you to make your goal more clear and understandable. Accordingly, you can easily determine the functions that should be in a mobile app and take your steps to reach your aim. Identifying the audience that is possible to use your app plays a great role in developing and marketing your app. Understanding users’ expectations, needs and how they will use the app can lead you to publish an app that is more user-friendly. You can start analyzing by learning your target audience’s relationship with technology and what kind of solutions can satisfy what they need. For instance; surveys, user researches, and even face-to-face interviews may help you to do a correct evaluation. Many mobile app users and foundations aim to earn income from their mobile apps, however; the number of people who have no idea about making money with an app cannot be unseen. There are more than one income models for earning revenue from an app. It is advantageous for you to determine according to which model you are to develop your app. Subscription, in-app purchases or in app-advertising are one of the most preferred income models to make money with an app. By examining apps that are similar to your app, you can learn which income models they use and make a plan for yourself accordingly. App stores are full of apps that have never been downloaded or have become completely outdated without being discovered. You need to determine how you will advertise and market in the first step to avoid your app from becoming one of these useless apps. Not following “App commerce itself” motto and being visible is always an important aim in mobile app world. Preparing introducing texts, cooperating with bloggers and advertising are the ways for your app to come forth in app stores. Tips for developing an app: So, which app store? It can be extremely hard to choose an operating system such as iOS, Android, and Windows Mobile while developing a mobile app. However, the mobile operating system that you will prefer is directly associated with your target audience. A detailed plan is necessary for any working model today. A project formed by targets, analyses, introductions and evaluations ease the process to make a mobile app long-lasting. If you want to be a successful mobile app owner, create your MobiRoller account and take your step in the mobile world in a few minutes.